It’s an impossible task to catalog a year of travel by choosing ten of the ‘best pictures.’ So these are drawn from several favorite destinations in the Americas that I was blessed to visit during the past twelve months. I hope you enjoy them! My travel buddy, Dave, needed to check on a fish farm in Magdalena Bay and I tagged along to help with driving. From La Paz, we drove through Federales checkpoints on the narrow road to the coast. 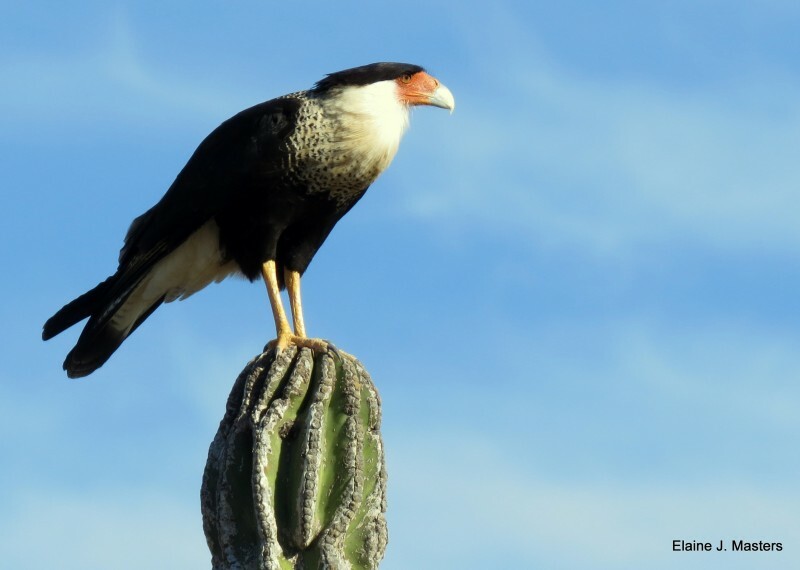 Just before rolling into the village of San Carlos, we spied noble raptors nesting on poles and hunting from cactus trees. It was a last minute trip but I jumped at a chance to visit Minneapolis with my 90 year old Aunt Fawnee for a family reunion. 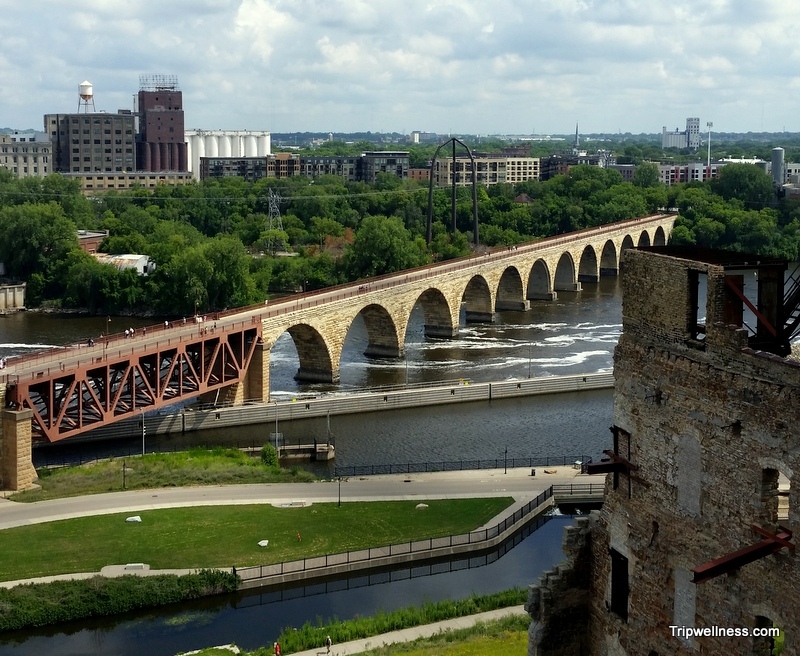 Over a few short days I toured the Twin Cities with a dear friend and fell in love with the riverfront. This view across the river was taken from the Mill City Museum. More about the adventure. 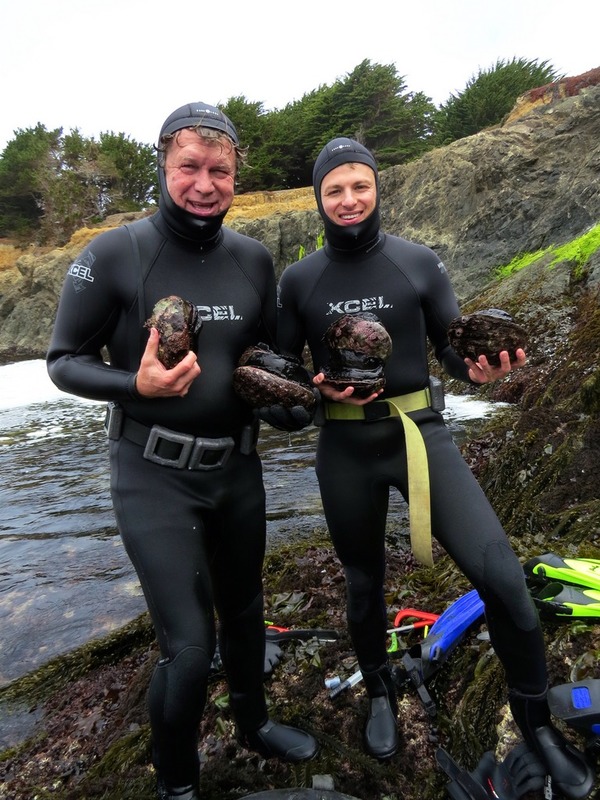 Dave and his son, Jeff, spent a morning free diving for Abalone off the rocky coast near Fort Bragg. Braving the frigid water, they soon pried their limit from the rocks. Diving, pounding and prepping the meat is a lot of work but what a feast we had! Read the whole story here. Getting the kid’s car to their new home in Philadelphia took us through 8 National Parks this summer. 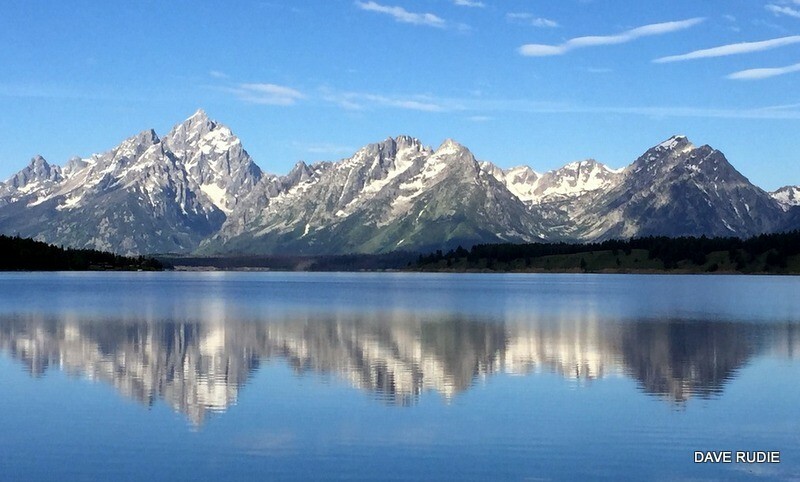 Dave’s picture gives a glimpse of the macro and micro beauty of Grand Tetons Park. It’s hard to pick a favorite National Park, but I’d return here in a heartbeat. 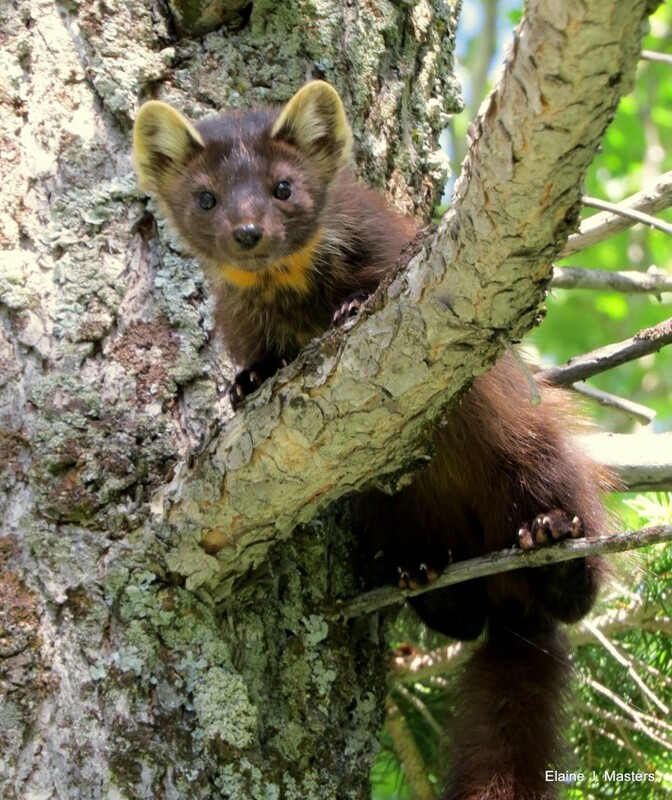 During a lakeside hike I heard a squirrel squealing. Turned out that he was dodging this creature in a life and death chase. Luckily, the pursuit stopped long enough for this shot before the predator loped away. I captured this in Glacier National Park. Watching the light shift from this vantage point at Two Harbors’ Banning House never gets old. For his birthday, Dave wanted to return to the spot where his company was born. 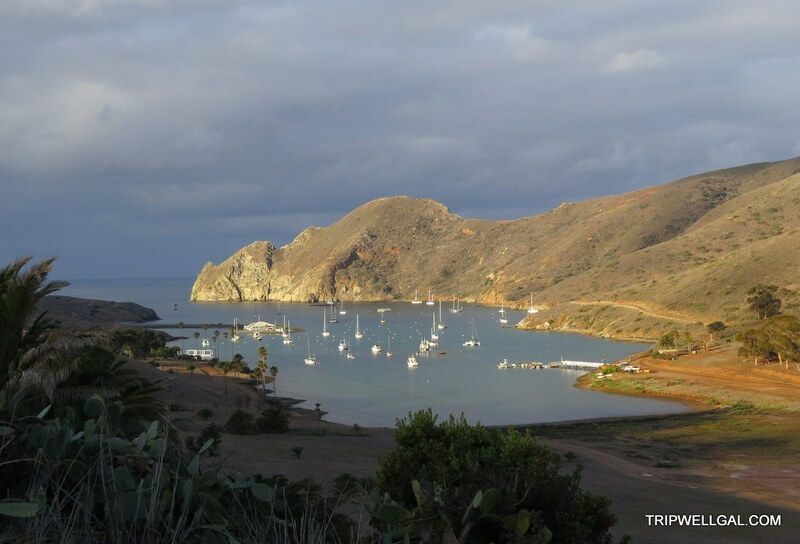 This is Catalina Harbor. Agar Canyon, where he would dry his seaweed harvests, is in the middle on the right. This year I my sister and I finally visited New Orleans. We exhausted ourselves over four days of walking through the different districts. 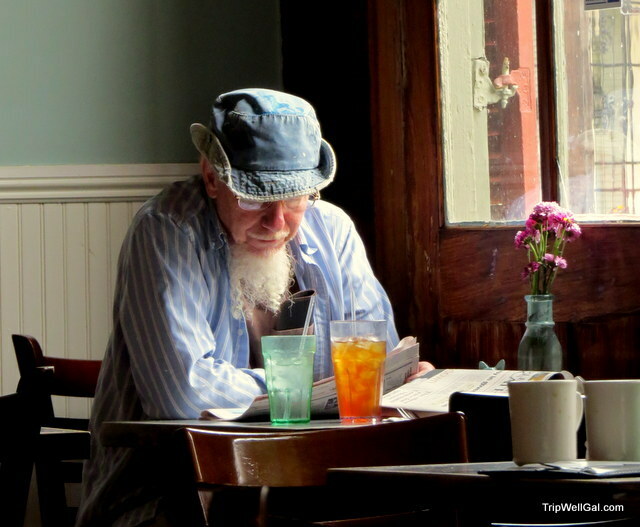 I spied this gentleman in Horn’s Cafe off Frenchman Street. In a soft drawl he said, “They call me Red, because my beard used to be so.” Read more about our discoveries in New Orleans. 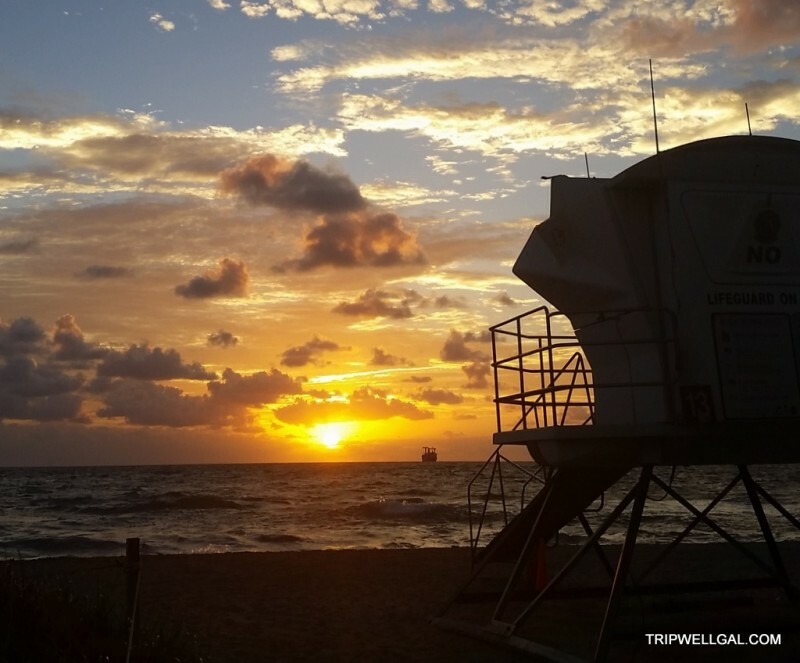 Nothing could have prepared me for the sunrises in Fort Lauderdale. On my first morning of a travel blogger’s conference, I woke, jet lagged and still on West Coast time. Checking my phone, I noticed a glow on the wall and turned to see this unfolding. Every day was a revelation. More of the story. We wrangled two dives in the Florida Keys before the winds kicked up and a small craft warning kept us landlocked. Off Ramrod Key we dodged jelly fish floating near the surface. I was so glad to be diving instead of snorkeling! A Goliath Grouper was hanging out under the boat on our last return. Picture: Dave Rudie. This is just one corner in the Wynwood District of Miami. An international group of mural artists have transformed the industrial neighborhood. It was the last trip before we escaped the steamy heat to happily spend the holiday season at home in San Diego. It’s an honor to be able to travel often for work and to tag along with my travel buddy and the love of my life, Dave Rudie. I hope you enjoyed this collection of my best pictures from the past year and hope that you too have many travels and discoveries throughout this beautiful planet we call home. If you love great travel blogs join me in exploring this linkup. Love these pictures, and I agree, it is so hard to choose ’10 best’! 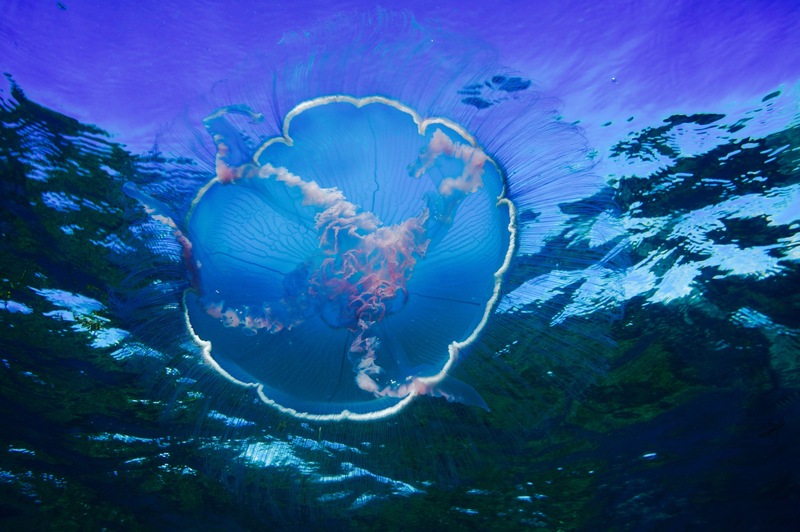 I love the photo of the jellyfish from your scuba diving adventure – that thing looks huge! Looks like you spent most of the year hopping all over the US – very cool! Thanks, Katie, I appreciate your compliments and yes, last year had me hopping around a lot. Hope your new year is full of cool adventures too. These pictures are stunning! 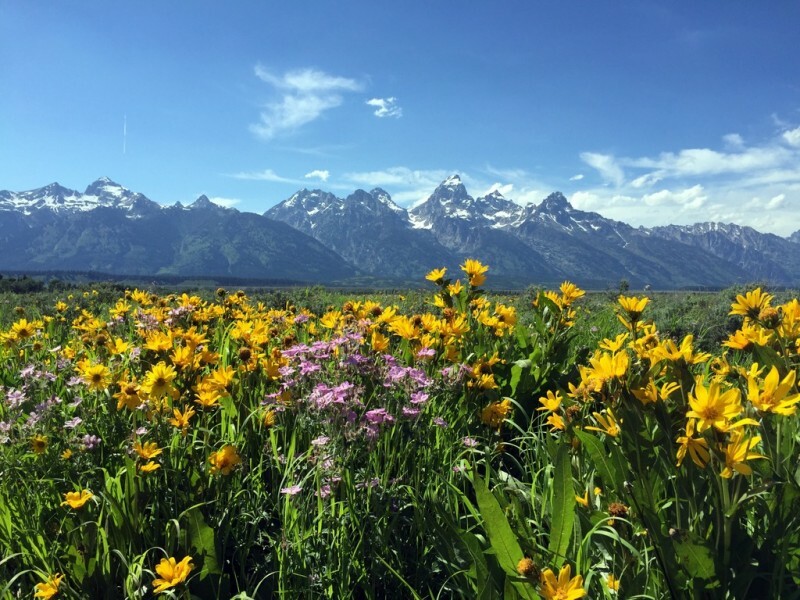 I just love the details of the yellow flowers in Grand Tetons National Park – I’m a sucker for mountain landscapes and would love to visit. Of the eight parks that we visited somehow Grand Tetons was my favorite. I’m a sucker for under-dogs and it gets passed over as tourists jump from Jackson Hole arrivals to Yellowstone just to the north. These pictures are stunning! I just love the details of the yellow flowers in Fort Bragg. I’m a sucker for mountain landscapes! The yellow flowers were in the Grand Tetons National Park, not that Fort Bragg isn’t spectacular in its own right. Liesbeth thanks for writing. I just loved New Orleans. What a heart-filled city full of art, music, food and bon temps. So many gorgeous pictures of the U.S. It’s a good reminder that even when we move home from Asia, there’s plenty to still explore nearby. 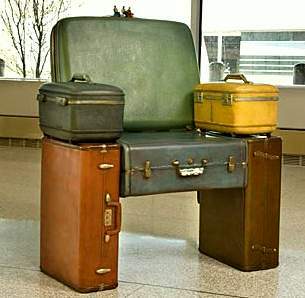 Expats always need to return if only in memory, but I hope you get a chance to explore more of the U.S. one day. It was a big year of travel for me, mostly work related but then family adventures get turned into stories too. I’m addicted to wanderlust! You are a fantastic photographer Elaine, what a special collection of photos. I especially like that you were able to road trip through 8 national parks. That’s awesome. Your photo of the Mexican raptor is also beautiful – wishing you a great year of travel in 2016. Dear Miranda, thanks so much for the encouragement. I love taking pictures – always dipping off the trail or lagging behind to capture something. I’m truly looking forward to another great year of travel. I hope so for you as well. These are all amazing photos – great job! But that one of the jelly fish takes the prize for me. It’s really stunning. Thanks, Laura. I’m lucky that my travel buddy is an underwater photographer and has been generously teaching me. Great photos from what looks to have been a fantastic year. Here’s hoping that 2016 is even better. Thanks, fellow gypsies. I wish the same for you. What a varied and incredible set of photos and experiences! I imagine that they are only the highlights of so many wonderful memories. Thanks, Irene. It’s true these are only a few of the highlights. Judging from your beautiful photos I’d guess your calendar was crammed full this past year. Glad you had a chance to get a couple of dives in while you were in Florida. I’m loving that jellyfish shot. Do you have an underwater housing, or is it a dedicated underwater camera? Dave has underwater housing various cameras as well as a Go Pro. I get to use the backup cameras. The jelly fish just frosting on an incredible dive. I’m seriously looking forward to 2016. I had to read your sentence twice when you wrote that you visited 8 National parks this past summer. Wow! Park overload, however, they are beautiful. I was transfixed on the photo of the gentleman in Horn’s Cafe. Really great photo. You have inspired me to do a post on my favourite photos from my 25 trips to France! I’d love to see your pictures of France! 25 trips too!! So glad that you liked the gentleman in Horn’s. I just left the bathroom and there he was at the window seat and the lighting was so lovely. I couldn’t resist taking the picture. Talking with him a few moments later was special too. The 8 National Parks was truly a whirlwind tour but there was limited time, the kids (both Millennials) set the pace and we just went with it. Now the task is to return and really savor those immense, extraordinary spaces. I hope you can too one day. What a wonderful collection of photos and travel memories. Wishing you lots more happy travels in 2016. Thanks, Donna, It was quite a year. I wish you many happy travels in the coming one too. Some really great photos. Several people have written about TBEX in Fort Lauderdale and shared pictures. I kick myself for not having gone. I’m hemming and hawing about the next one in Minneapolis. I’m off to read your article on it right now. Wish you could’ve joined us, Arnie. Minneapolis will be wonderful. I love Minnesota. 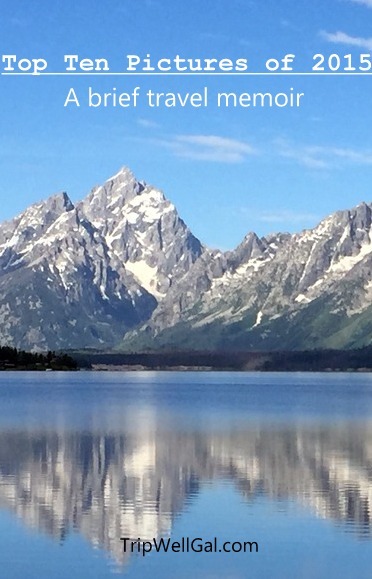 What a wonderful recap for your travel year, Elaine! I think we are so blessed to be able to travel. I’ve never visited the Grand Tetons or the Florida Keys, but I’d love to. They look amazing. 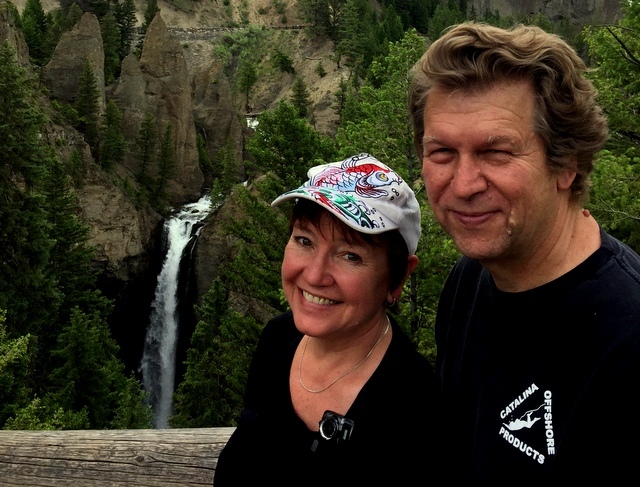 Thanks for the kind words, Anda.I live in gratitude to be able to travel. It’s been an unprecedented year for that. Onward!